This report has the necessary breadth and depth to reveal individual blind spots, pitfalls and challenges, making it easier to transfer type knowledge into real behaviour change. The Personal Impact Report is a powerful catalyst for comprehensive and long-lasting development. It provides a personalized framework for development that a person can use throughout their career. 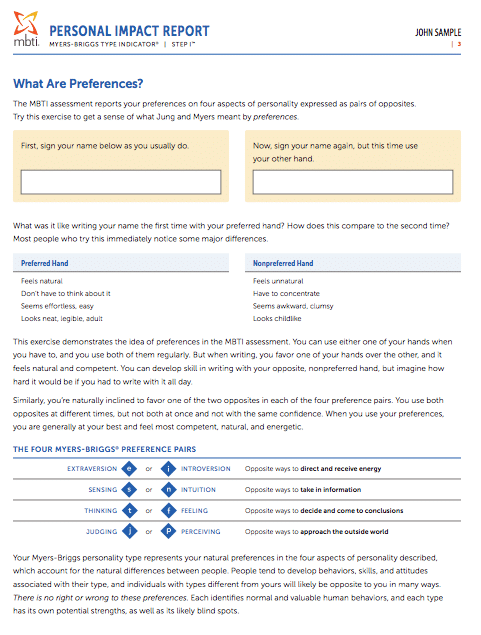 This longevity makes it the most cost-effective MBTI report available. If a respondent’s best-fit type differs from their reported type, a new Best Fit Version of the report can be generated at no extra cost. This report can be ordered through CareerID for 99 credits each by qualified MBTI practitioners. Want to become MBTI certified? Visit our Training page to learn more.